Van Nuys at 100. What Does It Mean to You? 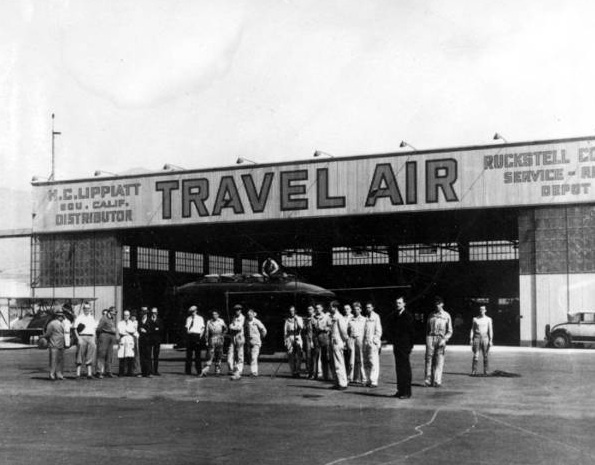 2011 marks the 100th Anniversary of the founding of Van Nuys. What does Van Nuys mean to you? Please send in your observations, memories, or stories related to Van Nuys, CA. 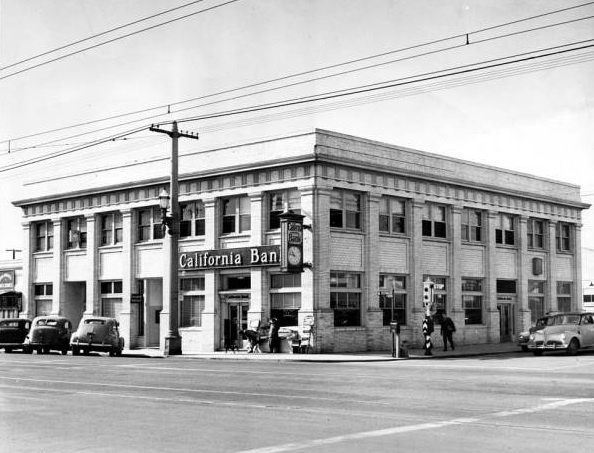 The California Bank is underneath the Country General Store on the SW corner of Sylvan and Van Nuys Blvd. The men are working on the PE line rails in front of the Syndicate Block which extended south from the Bank. 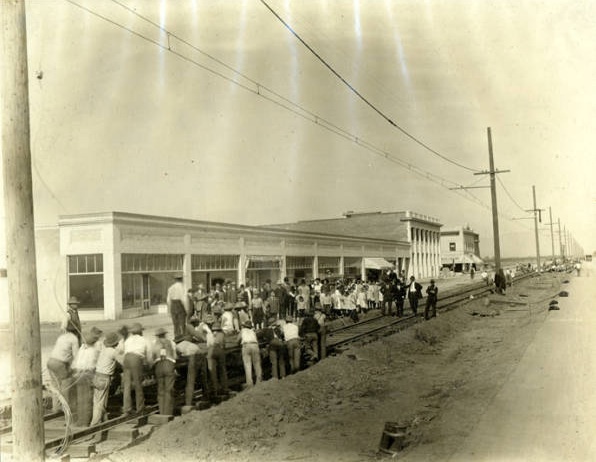 The photo is prior to December 16, 1911 as that is the date of the first PE car into Van Nuys. Great stuff. Growing up in the San Fernando Valley has left me with quite a few memories. We lived in Arleta, I attended Poly High School and spent MANY a Friday night at the Bob’s Big Boy. It might have been located in Panorama City, but to me it was always the essence of Van Nuys. Wednesday night were “cruise” nights and oh what fun was had! Now, years later, I again cruise Van Nuys Blvd. twice a day. My 14 year old attends Van Nuys Performing Arts High School, and laughs when I share my adventures of long ago. The city has changed, but not in my mind. I will always have special childhood memories of the area. Van Nuys’ Marching Band will be performing Saturday in front of the Government Building to help celebrate this occasion. COMING SOON…Van Nuys Community Cruise & Parade (count down to 100)!!! An episode of “Adam-12” filmed in 1974 on our street(Calvert St.)and my dad having a chat with one of the stars, Martin Milner during a break in filming. My dad working at the GM plant that was on Van Nuys Blvd. Thinking it was the norm everywhere that you’d see tv and movie personalities at the market, church, or just around town. I remember my dad telling us that when he first came to Van Nuys in 1961, one of the first movie stars he saw strolling casually around town was Andy Devine(who was an honorary mayor of Van Nuys). Stores such as Butler Bros., Grant’s, Vons’, McMahan’s, Kinney Shoes, Harris & Frank & Thrifty’s in the same shopping center on the Blvd. between Kittridge & Vanowen. the newsstand on Victory Blvd. & Van Nuys Blvd. the Magic Muffler(“The Purple Shop”)on the Blvd. I remember walking to school one day and passing by the Capri Theatre(thought it was the Fox, but apparently was the Capri)and seeing for the first time the movie poster for “M*A*S*H” and thinking how odd it looked. sitting in my backyard on a swing with my red Panasonic Toot-A-Loop radio(Christmas gift from 1971)and listening to nothing but KHJ. traveling down from our house on Calvert down Vesper and crossing Sylvan and looking over at the digital temperature reading the Valley News and Green Sheet had on their building and could have sworn it said 121 degrees…but was probably actually 112 degrees. One thing that will never change in Van Nuys(or the rest of the Valley): the blistering hot weather in summer. Barker Bros., Taylor’s, Sleep-EZ, Keys To Music, King’s Western Wear, Pierce Brothers Mortuary(up the street from our house), Copper Penny, Dale’s Markets, the Red Chariot(my dad went here), Chicken Delight, Pizza Man, Century Oldsmobile, all the other car dealers on the Blvd…lots more business establishments but just naming a few here. Too many other memories to list here but am waiting to read more memories of Van Nuys from others. Cannot wait for centennial next Feb. Will be there with bells on. Happy Birthday Van Nuys!! With so many people that still care about this town, I’m sure that one day in the(hopefully)near future, Van Nuys will be reborn and better than ever! very generous, heartfelt and nostalgic. Thank you so much for your wonderful reminiscence of Van Nuys. Your contribution to the oral history of this community is very generous, heartfelt and nostalgic. Thanks for those great photos, Andrew! Do you have any idea of where the location might be of that shot of the rail workers? Is that a shot looking north on Van Nuys Blvd., with the very California Bank building under discussion in the background? It’s hard to tell without seeing mountains in the distance was there obfuscating smog even 96 years ago?? I can’t believe you posted this pictuire of California Bank. I came to the site just now to get your email addres because I was about to send you the same photo and suggest you look at the Google street view of the property today. The street view shows a building at that corner that I believe is a severely modified version of this bank building. The number of windows is the same on both buildings as well as the size and the height of the wall beneath the windows on the first floor is also the same. The locations of the entries are also the same. Thanks for the email. I believe that the California Bank may have been on the SW corner of Sylvan and Van Nuys Blvd. where there is a Western/Latino clothing store that sells boots and Cowboy clothing. I too was born at Valley Presbyterian Hospital in Van Nuys in 1979 and only moved once, from an apartment on Sepulveda between Victory and Vanowen to a single family house at Van Nuys Boulevard and Woodman Avenue in Arleta. Some may despise Van Nuys (especially those that flock to Simi Valley, Santa Clarita, etc. ), I’m finding that those in Van Nuys live a smarter lifestyle – the ones who rides Metro 233, 761, 902, has helped make Van Nuys easier to traverse than those exhurbs, although not as traversable as the central LA region (Metro’s Westside/Central sector), but I’d also prefer Van Nuys over Northridge/Chatsworth for the ease of getting around. That being said, there is this suggestion by the LADOT to put a median busway on Van Nuys Boulevard (in this document: http://clkrep.lacity.org/onlinedocs/2010/10-0460_RPT_DOT_03-15-10.pdf). This is that Measure R SFV north/south bus corridor speed improvement project (the Valley’s Measure R project, while other regions get Metro Rail expansion). It’s not set in stone, although light rail is preferable (as is for the Orange Line, which was originally suppose to a continous run of the Red Line to Sepulveda station, and was proposed to be light rail, until the few people with louder voices degraded it to a busway), such a project can be a boon to Van Nuys and Panorama City (which has higher density than North Hollywood). One can hope that a good transit system (not that Van Nuys Blvd lacked adequate bus service) can revitalize the area. Another potential project from Metro is the I-405 transit corridor (mode unknown), but if it’s LRT or HRT, reaching into Van Nuys with connections to future rail service to the Westside, who would not want to live in Van Nuys? I believe the 100th anniversary is 22 February 2011 (source: http://articles.latimes.com/1996-02-22/local/me-38955_1_van-nuys). Let’s hope the City of Los Angeles has a big party planned. The reason I am hopeful for Van Nuys’ future is exactly due to its excellent location and potential for much improved public transportation. It’s amazing that the areas which are now considered “better” are way out on the fringe of the Los Angeles Metropolitan region. The other night, I had dinner with a woman who lives in Calabasas. Her husband works at Disney in Burbank. She talked about selling their home and moving “into town” meaning Toluca Lake or near the studio! Her husband’s daily commute is ghastly and takes over two hours total. That is ten hours a week sitting in a car! Light rail, buses, denser development around public transportation…that is the future. And it is a better future which only an ostrich could deny. I have been to Van Nuys almost daily commuting from Porter Ranch only 15 miles away working on Grandmas old house which is now mine. The Charming beauty which I restored it to, with the original Wood windows and original floors, gave me a flashback of a simpler, better time. Unfortunately now Van Nuys is like another country. Between the imbeciles driving down Burbank Blvd @25MPH and the sickening disgusting foreigners just over running the neighborhood throwing their cigarette butts all over the place, it is enough to make me puke. Not to mention the Cluster F 1-Hour drive from the 118 fwy to Burbank blvd, I say Good riddance. Grandma’s house was restored to remind me of its original beauty that it once was and honoring my grandmother and my family one last time before I had to sell it move on. The house has now sold for just under 400k (Thanks Granny-despite the banks giving every moron in the world a loan, you did alright for us, we appreciate your sacrifices) and Van Nuys is a distant memory, though one that will always remain close to my heart. Despite it all, home is where the heart is and I’ll always love Van Nuys for the Memories of the way things used to be, not what it’s become. A gateway to a promise of a better life is now just a footnote. Such a great story. Thank you for your contribution. Everything runs in cycles, some slower some faster. Van Nuys could be the next trendy neighbourhood. Might not happen in my lifetime, but hey, let’s all see what another 100 years could do. If enough positive energy abounds, including from those living in Porter Ranch, then I think we’d have a lot more hope everywhere.